I’ve done my fair share of tea in this town. Afternoon tea has been a serious obsession of mine since I had the luck of spending several summers in England during college, basically living on tea as a poor student. It’s also a favorite way of my girlfriends to get together. Over the years in Washington I’ve had afternoon tea everywhere – Henley Park Hotel, Four Seasons Hotel (sadly no longer serving), The Jefferson Hotel, etc. Noticing a trend? Afternoon tea here is mainly a hotel thing, with Teaism being the notable exception (or Ching Ching Cha if you want an Asian tea experience). With my absolute favorite afternoon tea spot being closed for renovations (that would be the venerable Jefferson, where the scones came out warm and fragrant at the perfect time), I thought I would try The Mayflower Hotel. They serve afternoon tea daily from 3pm-5pm in Cafe Promenade, a soaring orchid and mirror filled room. So where does The Mayflower fall short? Well, frankly, the goodies. The scones also looked great, but were crusty in a slightly stale way. 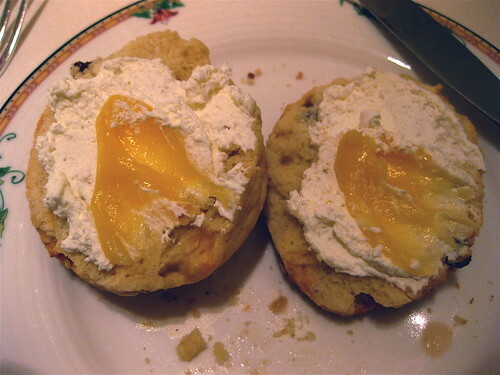 And I really don’t care for afternoon tea that serves scones with whipped cream instead of clotted. Though the lemon curd was perfectly tangy. We left quite a bit of the pastries uneaten, but had several refills of tea. So on the tea score, The Mayflower is fine. 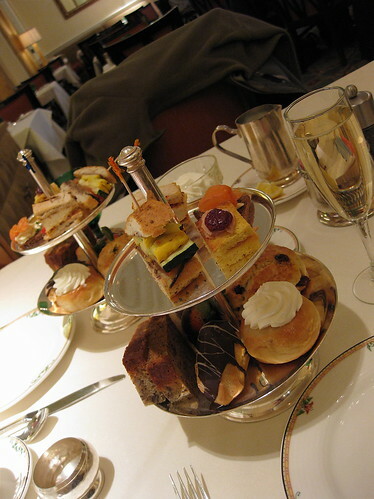 But I don’t want to pay $35 for a pot of tea without the precious pastries and sandwiches being delectable as well (ok, the elevated price is my fault, as I went for the “Royal Tea” with an added glass of champagne. Without it, I would’ve paid $25. But sometimes, a girl’s just gotta have bubbles…)! In defense of the hotel, it’s obvious from the fact that afternoon tea is fading from the city’s hotels that it isn’t a moneymaker. It must be difficult to stock up properly when you aren’t quite sure how many people will show up (then again, they do require reservations). In any case, I’ll stick to Teaism. Until The Jefferson Hotel reopens… they better not have messed with their tea service! I happen to be a coffee drinker. My grand father owned a coffee plantation. So, we grew up drinking milky sugary coffee even as toddlers. That being said, I have been to the tea service at the Ritz in Tysons and found it to be very good. Service is always good there. The view (while suburban) is acceptable. The “goodies” were good. Thanks for a well researched and presented review. Thanks Radman. 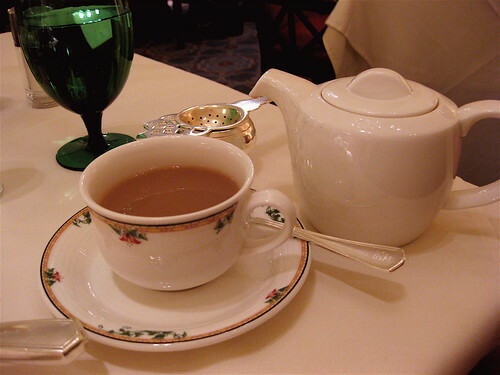 I’m car-less, so I won’t be able to sample tea at the Tysons Ritz, but you’ve reminded me I’ve actually never tried the tea at the Pentagon City Ritz, so I may have to take it there for a shopping break soon. And yes Jennifer, the renovation STILL continues at the Jefferson. They are currently claiming a mid-2009 re-opening. You know we’ll be first in line for tea and scones there!! As a tea lover, I felt their disappointment! The Tea Cellar in the Park Hyatt is wonderful. You order the type of tea you want ranging from $7 Earl Grey to $300 cave aged Pu-Erh. In the afternoons there is a buffet of goodies like scones and pastries that you can order with the tea or just have tea. Thanks Karon! The Tea Cellar does have an amazing selection. I’ve always thought of it as more of a “wine bar for tea”, with a tea sommelier and tastings, than as a spot for afternoon tea… but I will have to revisit and see if the goodies pass muster! How is the afternoon service at the Henley? Brenda, I haven’t been back to the Henley in quite a while. The last time I was there they switched over to using teabags, which I didn’t like. However I see now they are using Harney & Sons tea, so if it’s those lovely satchels H&S uses, that may be ok. They do it in the front parlour which is a small room with a fireplace – very Jane Austen. So nice, I would try it again, but it has been a while so I can’t completely vouch. Maybe this should be a series!